I am from Minnesota. I am a suicide survivor. 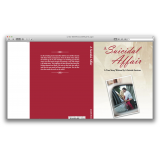 I wrote this book while grieving about the loss of my boyfriend to suicide. It was my only way to let out my feelings of extreme heartache and pain. This is my first book. In this revealing memoir, Jennifer tells the story of life's choices with bitter-sweet consequences. From the birth of her child at the tender age of 16, her marriage to an amazing guy that she wasn't sure she loved enough, and meeting a man who helped it all make sense. The judgment of those around her leaves her feeling ashamed and alone. She tries to find who she really is and face this new world of blame, guilt and pain after the man she loves takes his own life. Jennifer struggles at a young age with suicide. She gets pregnant at the tender age of 16 and loses the love of her life in her mid 20's to suicide. She is also dealing with her mother's alcohol problem. She becomes suicidal herself feeling guilt for her boyfriend's suicide and almost ends her own life.